We hope to meet you soon at one of our Surgeries. 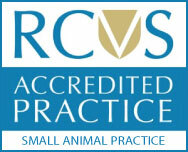 Introducing our new Registered Veterinary Nurse, Rebecca Davies. Obesity is an ever increasing problem in many of our pets. Cats are natural athletes and are highly active, but over the years this can take its toll. "A big big thank you to the team at Ystrad Mynach especially Nichi. Without the support, care and dedication of this wonderful team, we would have undoubtedly given up on him. After losing all use of his bladder/bowels and back limbs after an accident, the team gave us guidance on how to take each step at a time and through Nichi's expert knowledge on physio treatment little Sid is running, skipping, climbing and jumping again. We are thrilled. Would recommend this practice above any other. " "So pleased with the care shown to my dog and the extremely nice staff for their help with giving him his eye drops. Thank you all so much. "